As a 10-year-old girl, I fell in love with sailing the first time I went aboard a sailboat. Our skipper raised the sails like a glorious dove unfolding her white wings, the water riffled and gurgled against the hull as the boat took to its seaborne flight, and the only thing I cared about was learning to sail. Learn I did, and found that, dashing across the waves, I felt strong, capable, and free. Soon I began to read books about circumnavigation, like “Dove” and “Gypsy Moth Circles the Globe,” as well as Jack London novels like “The Sea Wolf,” and the true story of Richard Henry Dana’s “Two Years Before the Mast.” These sparked my own dreams of adventure and tall ship sailing. Through my teen years I sailed as often as possible, even briefly owning a little MIT Tech II sailing dinghy, that I sailed on a “pond” (big lake) in New Hampshire. I helped restore a few wooden boats, with two owners paying me cash and the third paying me with unrestricted access to the boat. This is how I came to spend a significant portion of my 14th summer singlehanding a small wooden dinghy on the Atlantic coast off of NH. I allowed the currents of young adulthood take me where they would, and I let my sailing dreams blow away, although my yearning never stilled. In 2005, I decided that it was time to bring sailing back into my life. This began with renting local Flying Scots, moved on to crewing for my first week-long gunkholing cruise, led me to become the head of a newly forming Sea Scout unit, brought me to teaching for Woodbridge Sailing school, and a 15-day, 1,000 mile sail with the 125′ schooner LIBERTY CLIPPER. That cruise gave me a taste of my dream of being an itinerant sailor and inspired me to chart a course to reach it. In August of 2015, I met my mark after I fledged the kids, gave away nearly all my belongings, fixed up the house, sold it, and took the live-aboard Crew Training on the tall ship KALMAR NYCKEL, my first square rigger. In 2017 I spent 4.5 as crew for New Jersey’s tall ship, AJ MEERWALD. I have written several blog posts about sailing adventures. Capable sailor with experience aboard a variety of vessels traveling in varied locations under differing conditions. Over 12,000 miles, 158 cruising days, 17 races, over 1,000 hours of day sailing since 2007. Racing, cruising, repositioning, delivering, teaching, and single handing. Vessels from 19′ to 125′, fore-and-aft and square rig. Familiar with charts, markers, dead reckoning, piloting, GPS, rules of the road, watchkeeping, anchoring, docking, mooring, night sailing, boat checks, diesel engines, outboards, heads, gas stoves, and can find my way around a galley. Sensible, safety oriented, notices when things are amiss and promptly reports them. Have a boat and need a hand? Drop me a line! Will sail for food and bunk, wind and fun! 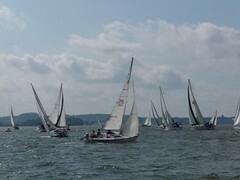 Check out my photos from various sailing and other nautical activities. You are not only a sailor and a photographer, but also a gifted writer! Thank you for what you do …sharing the joy of sailing …on the Internet. Ahoy, John! Thank you so much for your kind words, and for visiting my blog. You might like my newest post, titled “I saw that the world was flat,” about sailing offshore during a 1,800-mile boat delivery from Galesville, MD to Ponce, Puerto Rico. It was a fabulous experience! Fair winds to you!